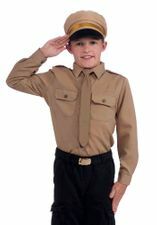 Available Sizes/Colors: Size 2T 4T "S (4-6)" "M (8-10)" "L (12-14)"
This realistic looking Navy SEAL outfit will get your child's imagination running as he/she has hours of fun pretending to be part of an elite military force! Costume available in toddler and children's sizes. Polyester, machine washable. Comes in a durable snap-sealed poly bag for easy use and storage.